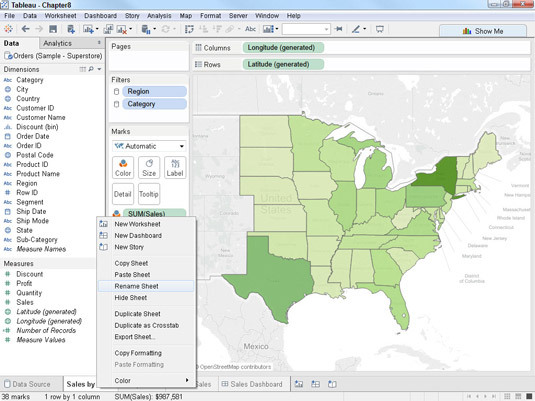 As you use Tableau, you’ll almost certainly be creating a number of worksheets. To make your life a little bit easier, you’ll want to name and organize those worksheets. Tableau’s default naming method for new worksheets you create is to call them Sheet 1, Sheet 2, Sheet 3, and so on. Although this is a logical way for Tableau to name the sheets, it probably won’t be very helpful when you want to add those visualizations contained on the worksheets to a dashboard or story. You’ll find it a lot more useful if you give each worksheet a descriptive name. Right-click the worksheet tab in the lower portion of the screen to display the tab’s pop-up contextual menu. Select Rename Sheet from the menu. Enter the name that you want to use for the worksheet into its (now editable) tab. Enter a name for the worksheet. Press Enter to apply the name. You can use any name you like for your worksheets, but you’ll find it most useful if you give them descriptive names relating to the content that’s included on the worksheet. Doing so will make it much easier for you when you want to add those visualizations to a dashboard or to a story. As you build larger Tableau workbooks that contain many worksheets (and possibly dashboards and stories), you may discover that keeping track of all the worksheets gets to be a little confusing. 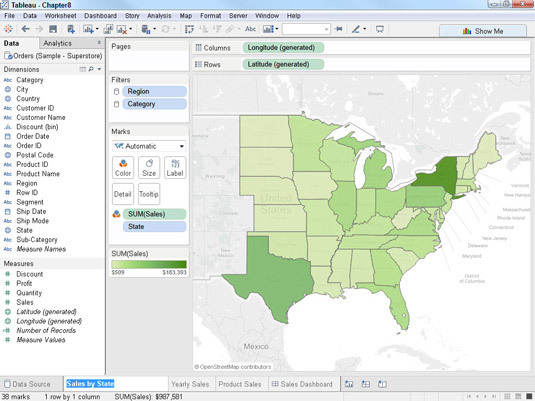 Fortunately, Tableau gives you a couple of tools to help you stay organized. Check out Tableau’s Sheet Sorter view, which you can access by clicking the Sheet Sorter button near the lower-right corner of the window. In this view, you can reorder worksheets by dragging and dropping. Use the slide sorter view to reorganize your worksheets. 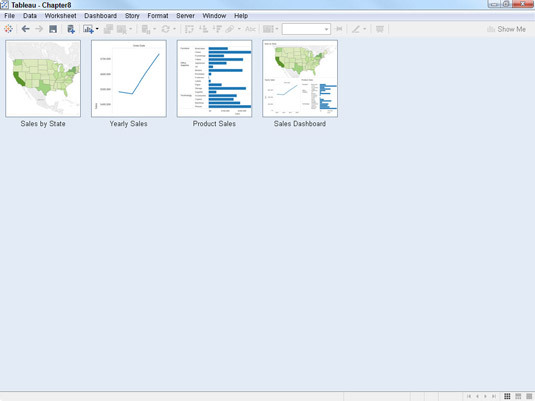 You can also use Tableau’s Filmstrip view, which displays the worksheets and dashboards as thumbnails at the bottom of the workspace, to reorganize your content using drag-and-drop techniques. In most cases, though, it’s easier to use Sheet Sorter view when you want to reorganize things. If you don’t want viewers to see the individual worksheets, you can also hide them by right-clicking the worksheet tab and selecting Hide Sheet from the contextual menu that appears. If you want to hide all the worksheets and only leave dashboards and stories visible, right-click a dashboard tab and choose Hide All Sheets from the pop-up menu. After you’ve hidden Tableau worksheets, it can be a little confusing figuring out how to get them back. To unhide all the hidden worksheets, right-click a dashboard tab and choose Unhide All Sheets from the pop-up menu. Worksheets that you unhide will appear as tabs following the Dashboard tab regardless of where they were before they were hidden.